← …and now for something completely different. Perhaps it's like Brigadoon and we haven't yet been patient enough. 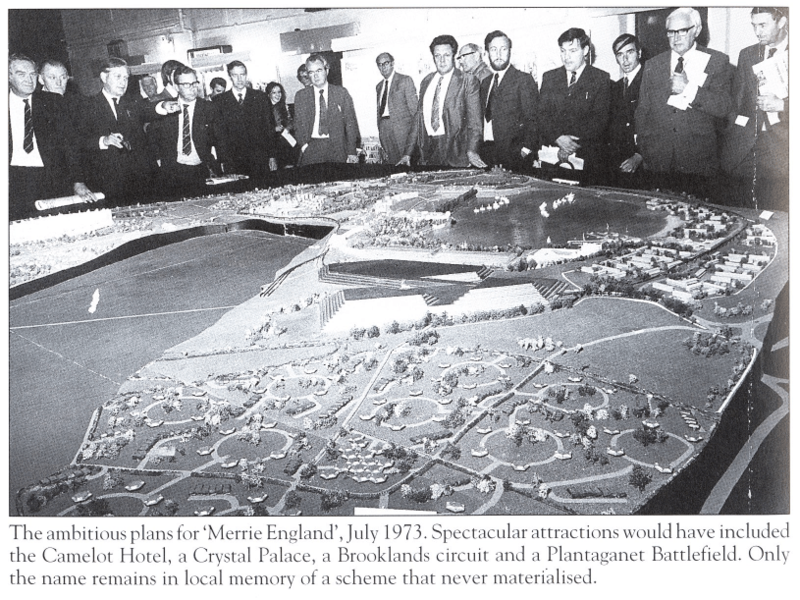 Photo of the demonstration of the Merrie England model, scanned by Steve Hames and taken from the book, 'Cannock Chase (Images of England)' by Sherry Belcher and Mary Mills. Further to my recent post about the early seventies phenomena that was the failed Merrie England project, I received a very welcome contribution from reader Steve Hames, of SJH Computing, who kindly scanned this remarkable image from the book ‘Cannock Chase (images of England)’ by Sherry Belcher and Mary Mills. I must confess that this is a title I wasn’t previously aware of, and I just ordered myself a copy. Is it me, or does that model, and the description, sound like an absolutely dreadful idea? Is it just my modern expectations, or was the concept duff, even then? This entry was posted in Cannock Chase, Environment, Followups, Interesting photos, Just plain daft, Local History, Local media, Local politics, Reader enquiries, Shared media, Shared memories, Social Media and tagged Brownhills local history, Cannock, Cannock Chase (images of England), Cheap tat, Derelict, Eric Morley, Local History, Local politics, Merrie England, Norton Canes, opencast, Orbital, planning, Poplars landfill, Poplars Tip, Redevelopment, Sherry Belcher and Mary Mills, Silly, SJH Computing, Staffordshire, Steve Hames, Theme park. Bookmark the permalink. The Merrie England project brings back many memories as I was doing a study of the Norton Canes and Chasewater areas for my college work at the time. My dad was a county councillor and was invited to the presentation by Mecca so I tagged along and remember having far too much free wine! I must dig out my project from the loft to discover the details but I do remember them spending £3M on landscaping the site and creating the lake which became quite a magnet for lots of wildlife seeking refuge from the greatly disturbed Chasewater. The scheme failed and the lake became literally a mountain of rubbish. The Kingswood open-cast mine followed and the only remnant of the Merrie England project is the wood bordered by the Cannock Road and Newlands Lane which was a plantation of young trees intended to be transplanted across the whole site. The Baron’s Court Hotel in Walsall Wood was developed from the old ‘Watersplash’ by an independent company attempting to take advantage of the massive visitor numbers expected to flock to Merrie England.